Disney XD has ordered a third season of Marvel’s Avengers Assemble (as Marvel’s Avengers: Ultron Revolution) and a fourth season of Marvel’s Ultimate Spider-Man (as Marvel’s Ultimate Spider-Man vs. The Sinister 6). Both seasons will debut some time next year. 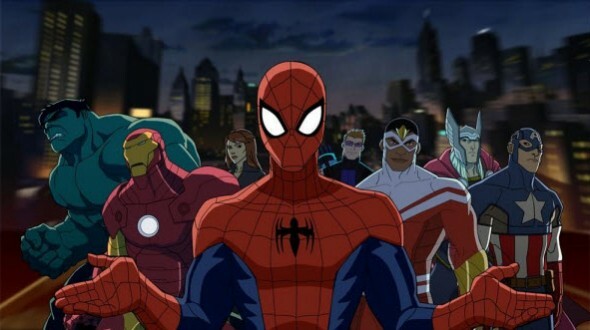 Disney XD has ordered two new action-packed seasons of the popular animated series on the Marvel programming block – continuing the adventures of Earth’s Mightiest Heroes with “Marvel’s Avengers: Ultron Revolution” and introducing a new band of villains in “Marvel’s Ultimate Spider-Man vs. The Sinister 6.” Produced by Marvel Television, both series deliver the biggest, most explosive seasons yet with some of Marvel’s most aspirational super heroes facing off against some of the greatest threats in the Marvel Universe. Both of the new seasons are currently in production and slated to premiere in 2016 on Marvel on Disney XD. In season three of “Marvel’s Avengers: Ultron Revolution,” the Avengers are not only shocked by the return of a vengeful Ultron, but they also encounter new threats like Baron Zemo, the Masters of Evil, the Inhumans, and the futuristic Kang the Conqueror. It’s only with the help of heroes like Black Panther, Captain Marvel, Ant-Man and Ms. Marvel that they have a chance of surviving an all-out Marvel super hero Civil War. In season four of “Marvel’s Ultimate Spider-Man vs. The Sinister 6,” a confident Spider-Man feels like the ultimate hero after fighting alongside The Avengers and leading a team of heroes at S.H.I.E.L.D. Academy. However, when the wall-crawler discovers that his greatest enemies – Doctor Octopus, Hydra and the all-new Sinister 6 – are working together to destroy him and S.H.I.E.L.D., he teams up with a special new team of Spiders, including Miles Morales, Agent Venom, Iron Spider and the mysterious new Scarlet Spider. Spider-Man and his new friends will need to use all of their power to overcome their greatest challenge yet. The “Marvel’s Avengers: Ultron Revolution” voice cast includes Adrian Pasdar (“Heroes”) as Iron Man, Fred Tatasciore (“Kung Fu Panda: Legends of Awesomeness”) as Hulk, Roger Craig Smith (“Wreck-It Ralph”) as Captain America, Travis Willingham (“Shelf Life”) as Thor, Troy Baker (“Ultimate Spider-Man”) as Hawkeye, Laura Bailey (“The Super Hero Squad Show”) as Black Widow and Bumper Robinson (“The Game”) as Falcon. Jeff Allen serves as Supervising Director and Eugene Son and Dani Wolff serve as Co-Story Editors on the series. “Marvel’s Ultimate Spider-Man vs. The Sinister 6” stars Drake Bell (“Drake & Josh”) as Peter Parker/Spider-Man, Chi McBride (“Hawaii Five-0”) as Nick Fury, Steven Weber (“Wings”) as Norman Osborn, Greg Cipes (“Teen Titans,” “Ben 10”) as Danny Rand, Ogie Banks (“Fatherhood”) as Luke Cage, Misty Lee (“Batman: Arkham City”) as Aunt May, and recurring guest star Stan Lee (“Spider-Man”) as Stan the Janitor. Alex Soto serves as Supervising Director while Kevin Burke and Doc Wyatt serve as Co-Story Editors. 2015 to date, “Marvel’s Avengers Assemble” and “Ultimate Spider-Man: Web-Warriors” are Disney XD’s Top 2 weekend original series in Total Viewers and across target Kid and Boy 2-11 and 6-11 demographics. Source: NTI, U.S. ratings, 12/29/14-5/24/15, most current, excludes repeats. Marvel Entertainment, LLC, a wholly-owned subsidiary of The Walt Disney Company, is one of the world’s most prominent character-based entertainment companies, built on a proven library of more than 8,000 characters featured in a variety of media over seventy years. What do you think? Are you looking forward to the new seasons? Is one show better than the other? More about: Marvel's Avengers, Marvel's Avengers Assemble, Marvel's Avengers Assemble: canceled or renewed?, Marvel's Avengers: canceled or renewed?, Marvel's Ultimate Spider-Man, Marvel's Ultimate Spider-Man: canceled or renewed? I love this show! So glad a season 4 of Ultimate Spider-man is coming out. I truly don’t care if I’m “too old” for this show. Never will I give up cartoons! Oh Thanx for this News….. I am happy to see that , the New season of spider man will be Return… i love Ultimate Spiderman …. First of all, I’m not a 10 yr old boy. And second, if I’m already NOT WATCHING ABC, why would I watch this junk?